PURPOSE AND PLAN.—This book aims to be a practical guide for the player of games, whether child or adult, and for the teacher or leader of games. A wide variety of conditions have been considered, including schools, playgrounds, gymnasiums, boys' and girls' summer camps, adult house parties and country clubs, settlement work, children's parties, and the environment of indoors or out of doors, city or country, summer or winter, the seashore, the woodland, or the snow. The games have been collected from many countries and sources, with a view to securing novel and interesting as well as thoroughly tried and popular material, ranging from traditional to modern gymnasium and athletic games. An especial effort has been made to secure games for particular conditions. 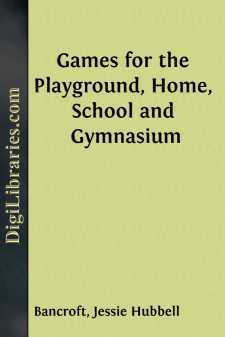 Among these may be mentioned very strenuous games for older boys or men; games for the schoolroom; games for large numbers; new gymnasium games such as Nine Court Basket Ball and Double Corner Ball; games which make use of natural material such as stones, pebbles, shells, trees, flowers, leaves, grasses, holes in the sand or earth, and diagrams drawn on the ground. The description, classification, and arrangement of the games have been made with the steadfast purpose of putting them into the most workable form, easily understood, with suggestions for getting the most sport and playing value out of them, and with means of ready reference to any class of games for use under any of the conditions mentioned. The series of indexes which accomplish this last-mentioned purpose make it possible to classify the games in many different ways, sparing the reader the necessity for hunting through much unrelated material to find that suited to his conditions. The index for schools is essentially a graded course of study in games. The ball games requiring team play have been described according to an analytic scheme not before used for the class of games given in the present volume, which makes it possible to locate at a glance information about the laying out of the ground, the number, assignment, and duties of players, the object of the game, rules and points of play, fouls, and score. The various kinds of balls are described with official specifications. Diagrams for all kinds of games have been supplied unsparingly, wherever it seemed possible to make clearer the understanding of a game by such means, and pictorial illustration has been used where diagrams were inadequate. The music for all singing games is given with full accompaniment. Suggestions for the teaching and conduct of games are given, with directions for floor formations. Means of counting out and choosing sides and players are described, and one section is devoted to forfeits. Under each of the main divisions chosen—miscellaneous active games, quiet games, singing games, bean-bag games, and ball games—the material has been arranged in alphabetic order to facilitate ready reference, although a general alphabetic index is appended. In short, the book aims to bring together all related material and every available device for making it readily accessible and easily understood.